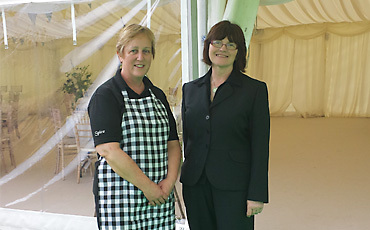 Jane Batey and Ruth Little have over 30 years experience in catering and are both farmers daughters, who were both brought up on good wholesome food made from homegrown meat and vegetables. It is this background which is at the essence of what we do and gives us our own ‘Spice’ style of food.. Whether it's catering for an agricultural event, spectacular food for a wedding, or outside catering for a private event, Spice Caterers can provide the planning and preparation, exquisite food, and impeccable catering service that will make it simply unforgettable. Spice Caterers are a highly professional and extremely dedicated event catering company, created by a team of catering and event management specialists with over 30 years experience in the business. Our food is infused with creativity and passion. 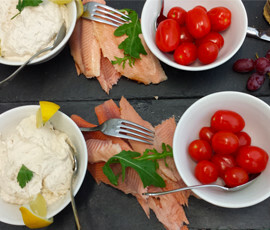 Delicious canapés and contemporary bowl food are great for socialising whilst you nibble. Hearty barbeques, elegant afternoon teas and decadent dinner parties suit celebrating success whether that's an intimate party or a full scale wedding. The venue of any occasion or function, is an important consideration when planning an event and we offer advice on your choice of venue i.e. village hall, marquee etc. 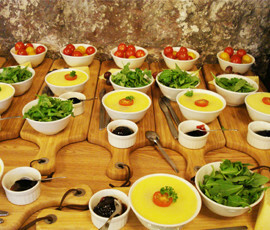 More importantly, the type of food that will be most suited to that venue and the requirements of our clients. Do you need buffet style food? Is the food hot, cold or a mixture of both? What food do you and your guests like? Do you want hearty food or finger food? It’s your meal and we know to get the menu you want we have to listen to you, talk to you and then create a menu for you and your tastes and budgets. Our food is tasty, trendy and sourced locally, while our service is the equal of our food – friendly, efficient and just the way you like it. Here is an example of a starter item which we created for our Kathryn & Alex Wedding. 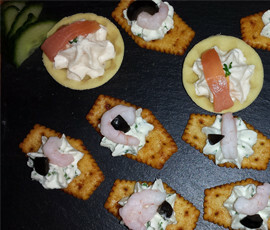 Here are some canapes from Amy & Michael Grant's Wedding in 2014. This is an example of fresh ingredients for this salmon and salad menu item from the Anna & Andy Wedding. Just read our testimonials to get an idea of how our previous clients feel about our service. We are used to catering for large groups of people at big events and other formal social gatherings like weddings. 100th Birthday Dacre Hall Lanercost. 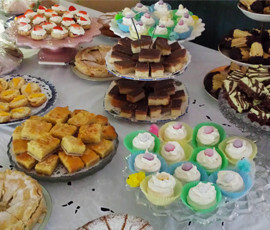 We cannot thank you enough for the superb catering; it was all and more than we could have hoped for. The whole party was a success and enjoyed by all ages especially our star who is an amazing lady for 100 years.